We’re down to the line! Share Our Strength’s Taste of the Nation at Tre Piani Restaurant! Sunday, May 20, 2012, 2:00-5:00pm. Join us for Share Our Strength’s Taste of the Nation, Princeton. Mix and mingle with the area’s hottest chefs and food producers, all of whom are coming together to donate their time, talent, food and passion to end childhood hunger in America. 100% of ticket sales supports Share Our Strength’s efforts! VIP $125.00 per person. General Admission $85.00 ($95.00 at the door). For tickets and information, visit: www.strength.org/princeton. For directions, visit: http://www.trepiani.com or call 609-452-1515. Cut off the tips and the tough ends of the asparagus, and reserve the tips. Chop the middle portion of the asparagus. Heat the olive oil in a heavy bottomed sauce pot, add the garlic and cook until lightly browned. Add the chopped asparagus. Cook over medium heat with half of the salt until tender. Add 1 ½ cups water and bring to a simmer. Let the mixture reduce by half and add the cream. Reduce by another half. 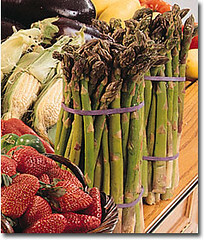 Let the asparagus mixture cool and puree in a blender or use an immersion blender. For optimum results, strain this puree to remove any tough parts of the asparagus. Add the puree back into a sauce pan and add the asparagus tips and parsley. Bring to a simmer and cook until the mixture coats the back of a spoon. Season to taste with salt and pepper. The sauce can be cooled and reserved up to 3 days at this point or kept hot and used immediately. Bring a large pot of lightly salted water to a boil and add the pasta. Cook until al dente, about 3 minutes. Strain the pasta and drain completely. Add the pasta to the sauce and stir in the cheese. Portion or plate onto bowls or a platter and garnish with the shaved Parmigiano. Photo courtesy of Rugters NJ Agricultural Experiment Station.